Touratech is always striving to improve the performance of our products. Since the Zega Pro pannier system was introduced in 2009 it has been the standard for motorcycle luggage and the choice of two-wheeled travellers around the globe. This year we’ve made a few upgrades to the Zega Pro and we’re really excited to announce the availability of Zega Pro: Next Generation. Like the original Zega Pro’s, the next generation boxes are rugged, reliable and strong but lighter then most plastic cases. They’re also very versatile and have many uses besides carrying cargo! 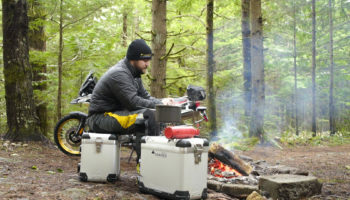 We asked Touratech Chief Riding Officer to answer a few of the questions about the new Zega Pro pannier system. 1) Why try to improve something that is already proven to be such a high performance product (Zega Pro)? Constant improvements make great products. 2) Why is the shape of the new lower seal lip a big deal? 3) How are the boxes constructed differently? The new Zega Pro boxes use a different lid seal design that makes the lid easier to close and increases the strength of the box. The new Zega Pro also uses a different production process for the construction of the lid and pannier bottom. This new technique eliminates all of the welds in the corners which makes for an even stronger pannier than before. 4) Do they look different? Externally the boxes are identical. The weld-free corners are still covered with the replaceable corner and edge protection so unless you have the box open you can’t see the difference. The only external tells are the two small bolts added to the lid for mounting the optional carry handles. 5) What’s up with the screws in the lid? Do they leak? The small screws on the lid are installed at the factory with seals for a lifetime waterproof seal. If you choose to remove those bolts, the holes are pre-drilled perfectly for mounting the optional pannier carry handles. 6) Are the release pucks any different? The release pucks are identical to the previous versions. 7) Will I need new racks? The racks are identical to the previous versions. If you have ever had Zega cases without any exhaust cut out on your bike, the new version will fit great. The Zega rack is extremely strong with multiple mounting points along the bikes subframe, distributing weight evenly. 8) Do they come in the same colors/finishes? The new version is available in the same Bare Aluminum, Silver Anodized, and Black Anodized finishes as before. 9) Are my original Zega Pro’s obsolete now? Just like the Oil Cooled R1200GS, the original Zega Pro boxes are still fantastic and work great. Incremental updates don’t make products obsolete, they just improve the product and overall experience.